Skin care can be overwhelming. Everyone’s skin is different and finding the best organic face cleanser for your unique skin type isn’t easy. 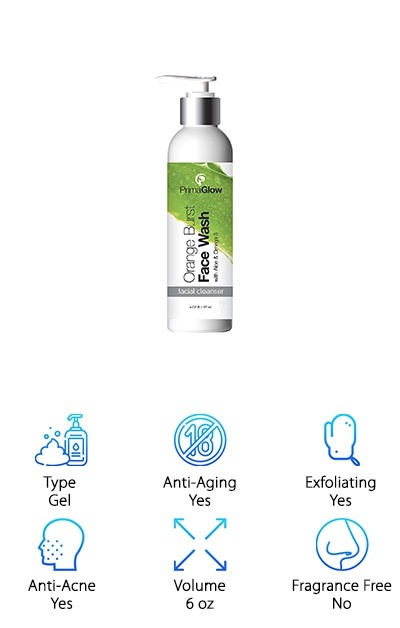 That’s why we did plenty of research to bring you this organic face cleanser review. We included something for all skin types, too! Before we get started, let’s take a look at some of the features you need to know about these products before you can choose the right one. Type: There are a few types of cleansers, including liquids, foams, scrubs, and gels. They each treat your face a little differently. Which one is best depends on your personal skin type and the kind of cleanser you like to use. 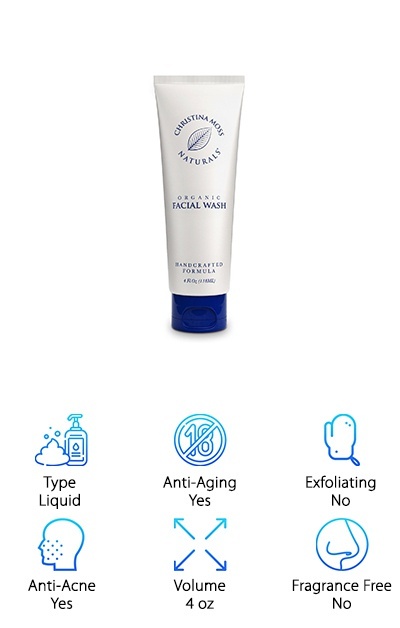 Anti-Aging: If you’re looking for something to keep your skin looking younger, look for a cleanser that exfoliates and moisturizes. Anything with Vitamin C and packed with antioxidants is good, too, because it will help boost collagen production. Exfoliating: There’s no better way to get rid of dead skin cells than by exfoliating. Make sure you get a mild one if you have sensitive skin! Some of these use silica or jojoba beads as their exfoliating ingredient, staying organic natural. Anti-Acne: Salicylic acid and tea tree oil are 2 anti-acne ingredients. They act as antibacterials, getting deep into your pores to kill the bacteria that causes acne. This clears up the acne you do have and helps keep it from coming back. Volume: Most of these cleansers come in 4 - 6 oz bottles but a few are larger. Keep in mind, with most of these cleansers you use a dime sized amount with every wash so 4 - 6 oz lasts a while. Fragrance Free: None of these products have any added fragrances, but that doesn’t mean they’re fragrance free. Only one of our picks is truly fragrance free. The others smell like their natural ingredients which is certainly not a bad thing. Now that you know a little more about these products, let’s get to our reviews. You might be using the best oil cleanser for oily skin without getting the results you want. The products we chose could help you find a better way. Check out our top pick and budget pick first if you’re short on time and stick around if you can to learn more about the other awesome products we found. Ready? Let’s get to it! 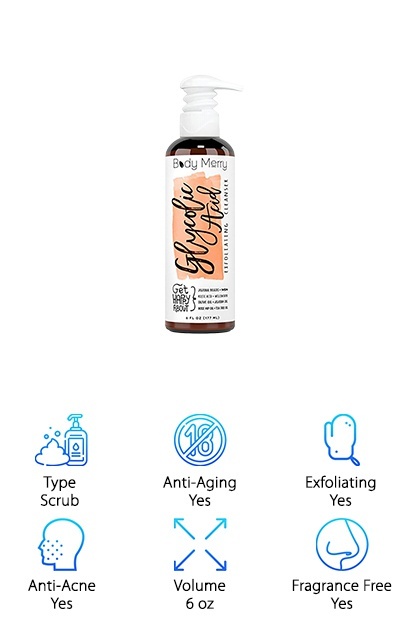 One of the reasons that this Body Merry cleanser is our top choice is that it’s one of the best rated facial cleansers. But that’s not the only reason. This cleanser gives your face a deep clean by using various oils that penetrate deep into the skin, like rosehip, jojoba, and tea tree oils. For exfoliation, 2.5% glycolic acid, willow bark, and jojoba beads help wash away dead skin and other dirt to clean clogged pores. You get long lasting effects from this cleanser, too. Like what? Like less age, sun, and dark spots and other signs of premature aging. Plus, it will help clear up acne and lighten acne scars. This is a great cleanser to use as the first step in your morning skincare routine. And here’s the best part! Body Merry offers a 90-day guarantee. This formula from PrimaGlow is our choice for best oil cleanser for acne. Not only that but it also reduces large pores, blackheads, and minor breakouts. So, how does it do it? It’s all thanks to their unique blend of oils and exfoliants. This product features a blend of several essential oils including sweet orange, coconut, and hemp oil. It’s also a really great exfoliant and uses salicylic acid containing white willow bark to remove dead skin cells and deep clean pores. The rich nutrients provided by these ingredients eliminate the bacteria that causes acne. Plus, it doesn’t add anything to your skin that can lead to acne, either. It’s paraben, phthalate, and sulfate free and made vegan and cruelty-free in the US. And one more thing, they provide a no questions asked 30-day guarantee. Looking for the best drugstore cleanser for sensitive acne prone skin? 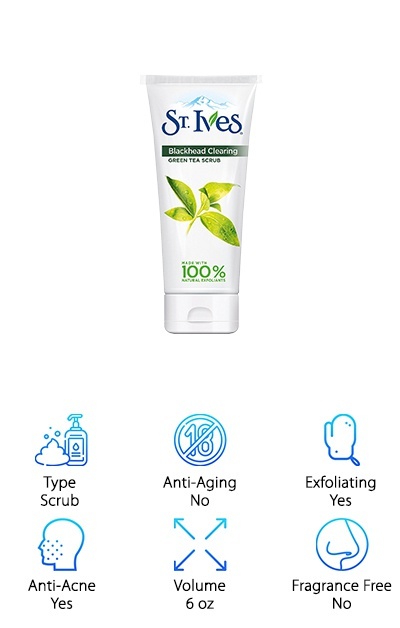 This St. Ives Face Scrub is an awesome choice. St. Ives is well known for their scrubs. This one was specially formulated with green tea to help unclog pores, reduce acne, and eliminate blackheads. You’re probably wondering what makes it so special. We’ll tell you: green tea and olive leaf extracts. More specifically, the salicylic acid in the extracts. What’s so great about salicylic acid? It does just what you want an acne fighting cleanser to do - unclogs pores and calms redness. They also add in hydrated silica as a mild exfoliant to help rid your skin of dead cells, dirt, and debris that could otherwise clog your pores. It’s a moderate exfoliant, too, which is good because it’s effective without being too hard on your sensitive skin. 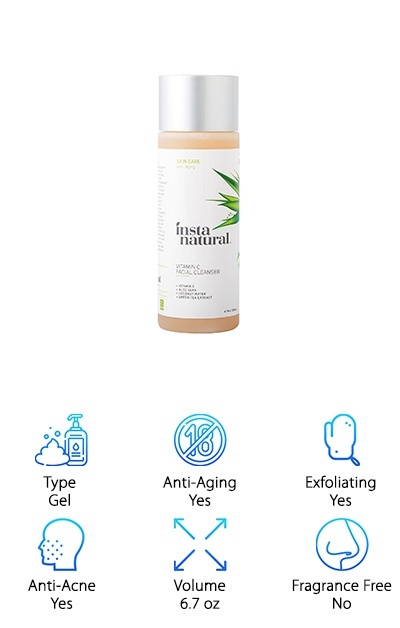 InstaNatural Facial Cleanser is our pick for best facial cleanser and moisturizer. The one puts a lot of emphasis on its anti-aging properties, which is why it uses a powerful retinol cream moisturizer among other. That’s not all it has. It’s made with all natural ingredients like chamomile, green tea, aloe, and coconut water and soothing oils. That helps it penetrate your skin to deep clean pores. There are even exfoliating boosters to wash away dull, dry skin. These ingredients provide a lot of antioxidants from Vitamin C that help prevent signs of aging by promoting the production of collagen. This one can also help reduce discoloration and correct some sun damage, too. This is a great choice for everyone, whether you have dry, oily, sensitive, or combination skin. The unique blend of ingredients helps brighten any face. 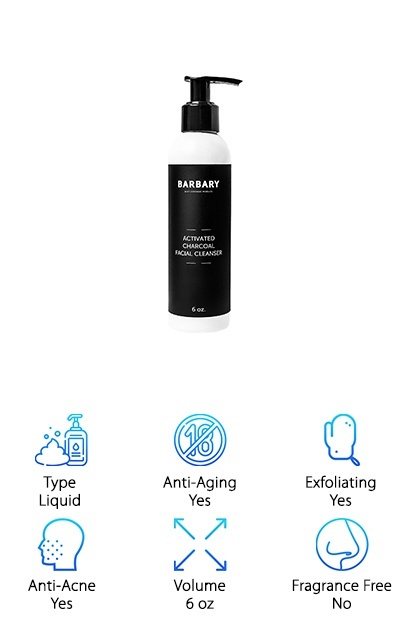 A cleanser for oily acne prone skin that’s made for men, this one from Barbary is one of the best. This one contains activated charcoal, something that’s been really popular lately. And no wonder! Charcoal is a natural, effective way to pull impurities from your skin. That means it’s a great way to give your face a gentle deep cleanse. There’s lots more goodness in this liquid cleanser, too, like coconut oil, Vitamins C and b5, green tea, white tea, orange peel, and tapioca. Just imagine how good it smells with ingredients like coconut, orange peel, green tea! We were really impressed with this cleanser. Barbary hand makes all of their products in small batches so they can continually monitor the quality and it shows. Plus, they have a 100% money back guarantee if you’re not happy with your purchase. Anyone who has skin problems knows that it’s not always easy to find organic face cleansers (or any cleansers for that matter) that work acne, oily or dry skin, or rosacea. You’ll find some familiar ingredients here that you’ve seen in some of our other picks: aloe, coconut oil, tea tree oil, and salicylic acid to name a few. So, what makes this such a great acne cleanser for sensitive skin? The addition of things like St. John’s Wort, pomegranate seed oil, and dandelion root. This cleanser is gentle enough that it won’t irritate really dry skin but tough enough to fight acne, blackheads, and redness, moisturize dry skin, and balance oily skin. Plus, it’s made of all natural, food-grade ingredients. If you’re not satisfied with your purchase, they offer you a 60-day full money back guarantee. This facial cleanser for oily acne prone skin is also great for normal, dry, or combination skin. It was developed to be gentle and nourishing so it doesn’t irritate dry skin but still tough enough to wash away any excess oil and impurities. And get this: it leaves the natural oils behind, leaving your skin perfectly hydrated. This liquid cleanser is chocked full of awesome ingredients like honey, coconut milk, jojoba oil, and rosemary. These ingredients also give it some anti-aging capabilities. You’re probably wondering exactly what it does to help you look younger. In addition to repairing damaged skin, it also helps to improve elasticity and prevent wrinkles. They use sustainable ingredients and bottle their product in small batches to assure its quality. And here’s the best part. If you’re not satisfied, Foxbrim will issue you a full refund. 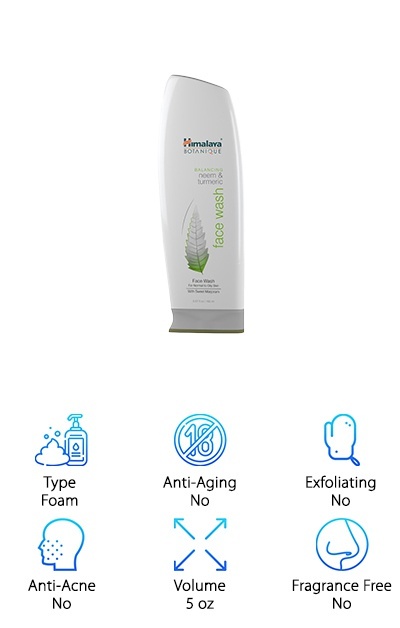 You might look at this Christina Moss Naturals Face Wash and wonder how long a 4 oz bottle is really going to last. Here’s the thing: this facial cleanser for acne prone sensitive skin is super concentrated. This 4 oz bottle will actually last you as long as an 8 oz bottle of most other brands. So, make sure you use a small amount when washing your face! What makes it one of the best natural face cleansers for acne? It’s as much about what’s in the formula as what isn’t. There are no harmful chemicals of any kind. No dyes, no added fragrance, nothing to irritate your skin or strip it of the oils and nutrients it needs. Christina Moss Naturals took 15 years to perfect this formula and they got just what they were aiming for. 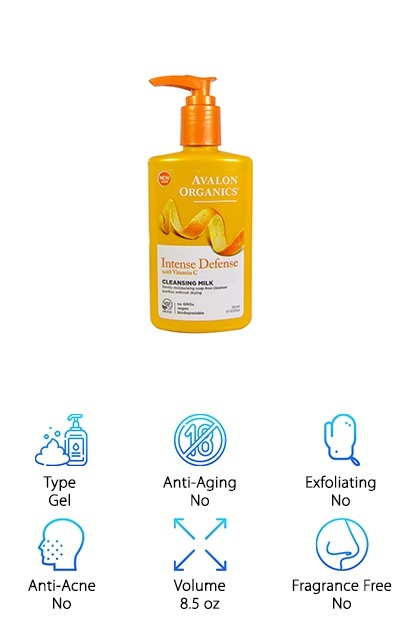 One of the best gentle facial cleansers around, this cleansing gel from Avalon Organics is surprisingly simple. It’s part of the Intense Defense line because it combats the stress and damage done to your skin from the environment. This can include everything from UV damage to sunspots to collagen deterioration. Ingredients include lavender, chamomile, white tea, orange oil, and Vitamins C and E. The Vitamin C is particularly important to this formula. In fact, it’s so important that they actually use 2 different forms. So, what does that all mean for you? 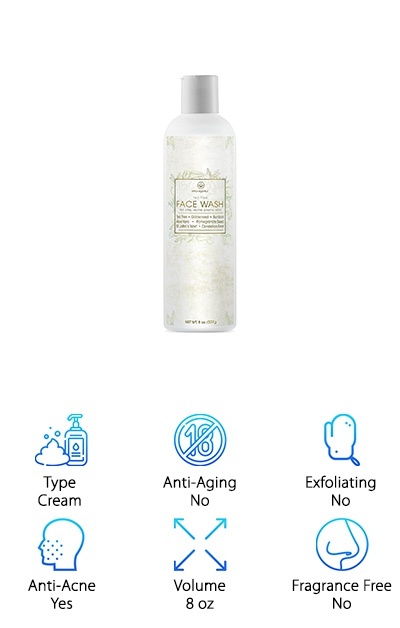 Well, it’s a great cleanser that gives a lot of health benefits to your skin. It foams slightly when you use, has a mild smell, and doesn’t leave behind any residue. There’s no dry or tight feeling after you rinse. Just soft, smooth skin. This natural organic facial cleanser from Himalaya Herbal Healthcare was designed to be the best facial cleanser for acne and oily skin. 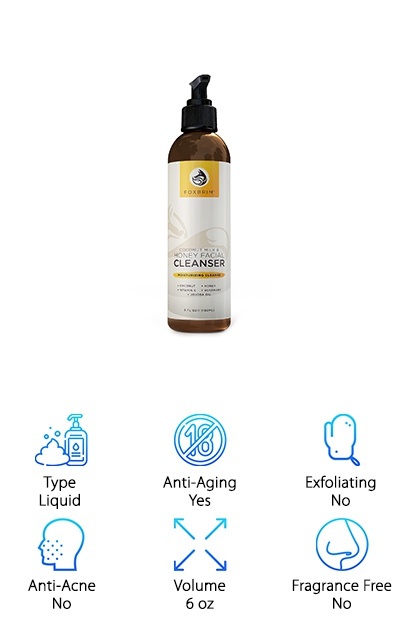 There are unique ingredients in this wash, too, like neem, turmeric, and natural Vitamin E. Not only is this an effective cleanser, it also evens out your skin and shrinks your pores. Get this: it doesn’t even have any soap in it. That’s right, it’s soap free and relies on the ingredients that have been used for centuries to purify your skin and leave it soft, smooth, and radiant. The history of this brand is impressive. They’re located in India and have been using all natural ingredients to develop their formulas since 1930. They continually study their techniques to make sure everything remains pure, safe, and effective. From our research, we think they’ve nailed it.